New Film Exposes the Shadow Govt. This film is the perfect gift to give your favorite “Obamanoid” that thinks “Dear Leader” is going to be different than Bush and solve all our problems! 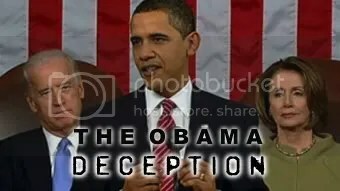 My only criticism (and it is a minor one) is that naming the documentary “The Obama Deception” is not quite accurate. Yes, it clearly shows that Obama is a lying, devious, New World Order stooge. But more importantly, it shows that the same people that pulled Bush’s strings are also the ones behind Obama. This film is an excellent introduction to some very powerful groups that the main-stream media rarely reports on. If you don’t know about the Bilderberg Group, The Council on Foreign Relations, The Trilateral Commission and others, then you really need to check this film out. It is interesting to note that one of the most critical commentator’s of Lord Obama in the film is historian Webster Tarpley. Tarpley correctly identifies just how subservient Obama is to the Wall Street money-masters. You see the truth is *NOT* Republican or Democrat…..it is truly non-partisan. The Truth is, with very few exceptions, most of the politicians in Washington are criminals, busily betraying the American People for their corporate/globalist/banking masters. Alex Jones does an amazing job of research and production. I hope you will support Alex by going to his website and ordering a DVD copy of the film for yourself or by becoming a subscriber to his show. The cost is negligible and the information is so important! Go to http://www.prisonplanet.tv for more info. Please help break-free your friends and family from the false “Left vs. Right” control paradigm most of us have been trapped in. The ruling Elite don’t care if you are a “Republican” or a “Democrat” to them you are just scum and a “useless eater” (their actual words folks, not mine)! Send everyone on your mailing list a link to this article or to Prisonplanet.tv. Spread the word, help take your country back! This entry was posted on March 16, 2009 at 11:33 pm and is filed under Bilderberg, Council On Foreign Relations, Finance & Economics, Mind Control, New World Order, Obama, Politics, The Bush Family, The Federal Reserve. You can follow any responses to this entry through the RSS 2.0 feed. You can leave a response, or trackback from your own site. Once you’ve watched the movie, as I have, you’ll realize that all of the dots are connected. There is no difference between the Republican or Democratic candidates, both are just puppets. Those in control always pull the strings so, old guy, black guy, doesn’t matter, the arms, legs and lips all move the same, the way the puppeteers what them to move. Great movie even if you can’t stand Alex Jones’s voice the movie is so good you don’t notice it.